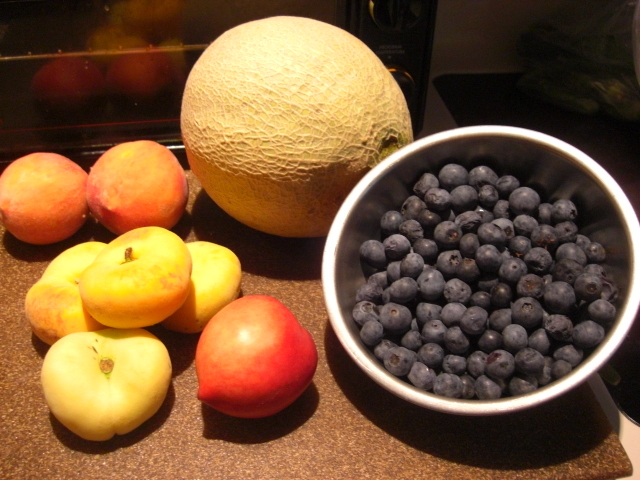 This week’s produce was a nice combination of stuff. 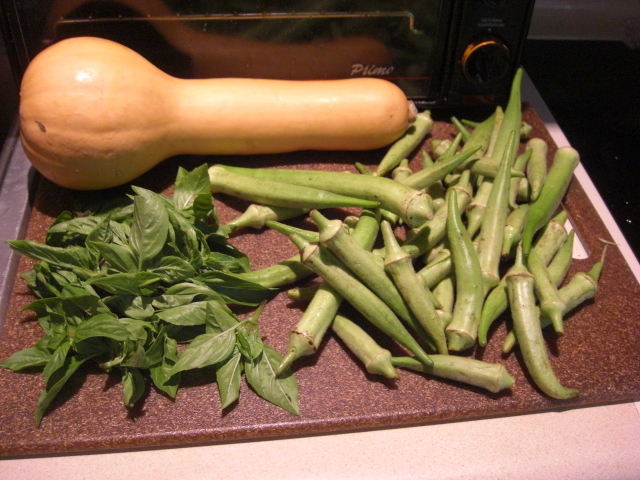 The basil, blueberries, and okra are summer favorites, and the butternut squash and figs are treats that make me think of fall. I also bought a few things from the online store. Aren’t the figs beautiful? They have this wonderful old-world oil painting look. I plan to bake mine with goat cheese, like this. 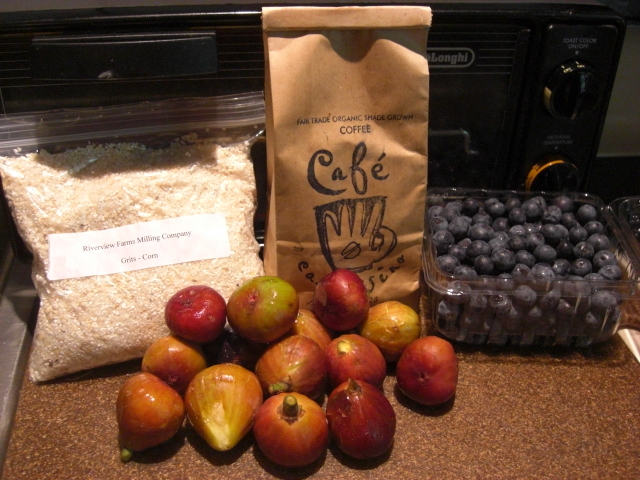 Here’s another option – fig, sweet potato, and wild rice stuffing. If I didn’t already have fig plans, I might try this with the butternut squash in place of sweet potatoes. If you’re looking for more of a dessert, consider Cajun Fig Cake. Sunday, I pulled out all the vegetables I’d frozen over the last several months and made vegetable stock. 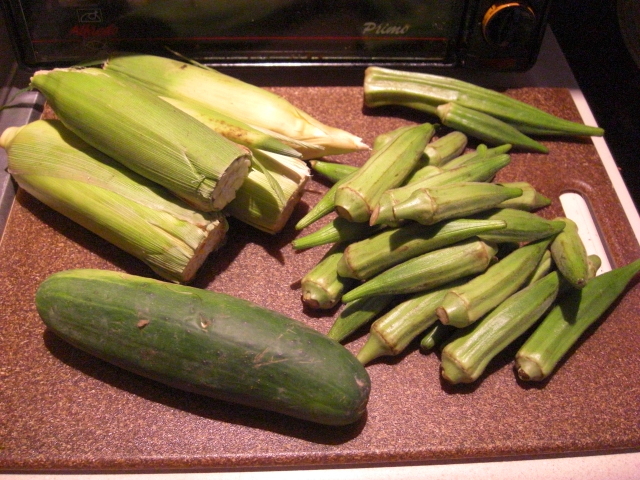 I left a couple of bags of blanched green beans, a bag of chopped celery, and a bag of corn. Everything else got thrown in the pot. 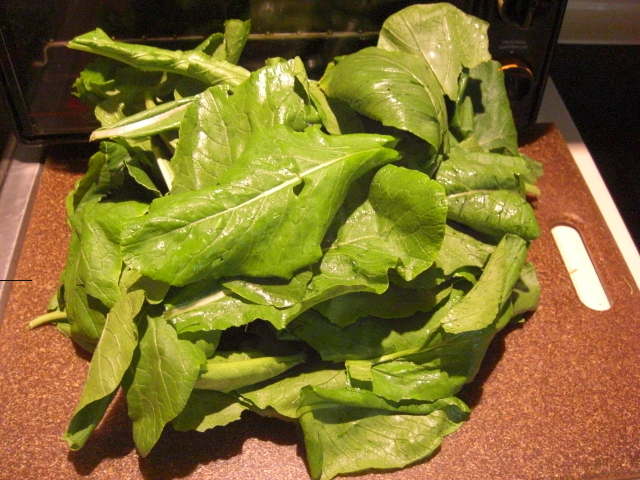 The frozen assembly consisted of spinach, kale, beet greens and stems, green beans, celery scraps, Shiitake and oyster mushroom stems, Swiss chard stems, and fennel. I also added some chopped onion and garlic cloves. 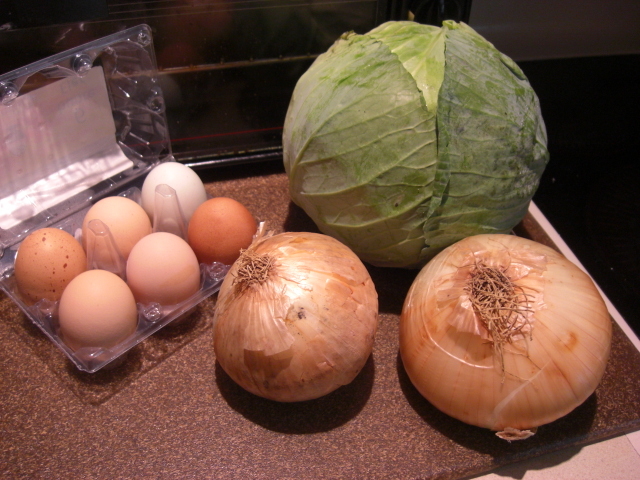 For stock, onions don’t need to be peeled or chopped. 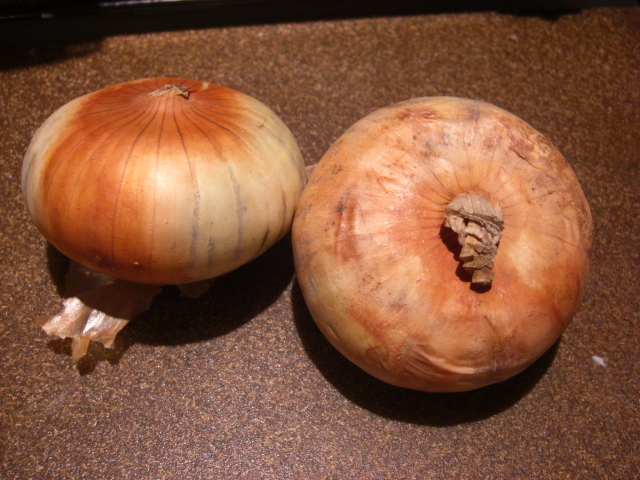 However, this onion had some powdery mold on its outermost layer, so I didn’t have a choice. First, I browned the vegetables in batches. The problem with frozen vegetables, however, is there’s a lot of moisture to get through before you get any browning action. 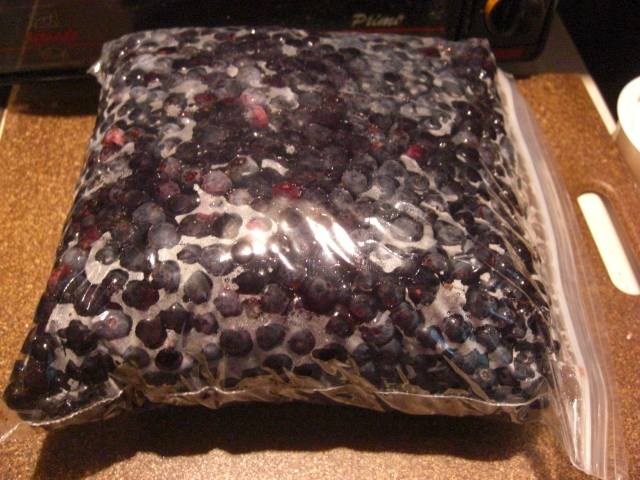 Maybe I’ll defrost and drain them next time. And possibly roast them in the oven instead of on the stove. 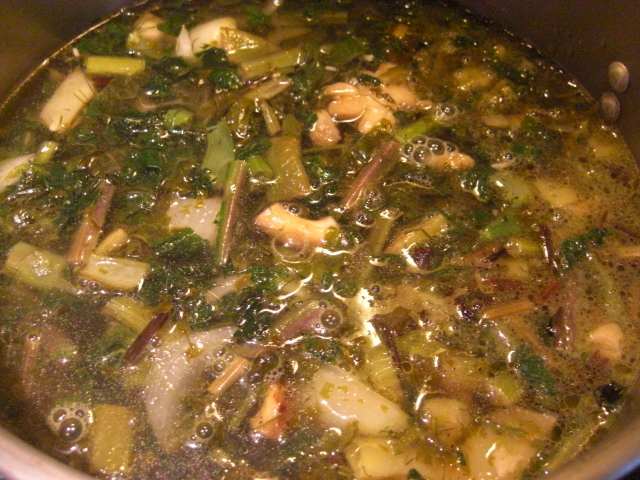 Second, the more-or-less browned veggies got tossed in the stock pot, which was then filled three quarters full of water. After bringing it to boil, I let the pot simmer for about an hour. Then I strained the stock and put it back in the pot to cook uncovered until it had boiled down to half as much. It’s easier to store concentrated stock. 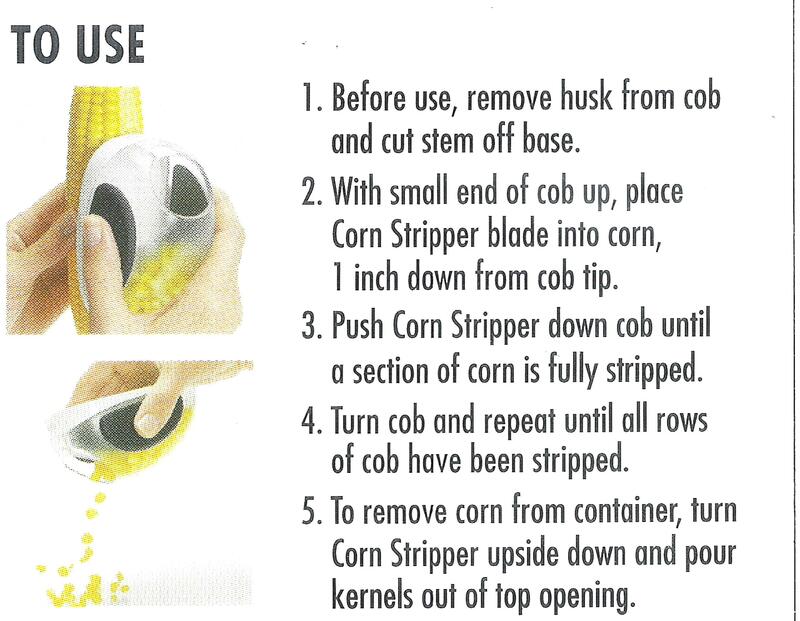 While cleaning upon our return from vacation, I stumbled across the instructions for the corn stripper. So I totally see now how Kitchen Kung Fu got gored. These instructions are dumb and dangerous. I must have either missed or ignored them because here’s how I’ve been doing it. First, shuck the ear, but don’t remove the stem. It’s handy to hold on to. 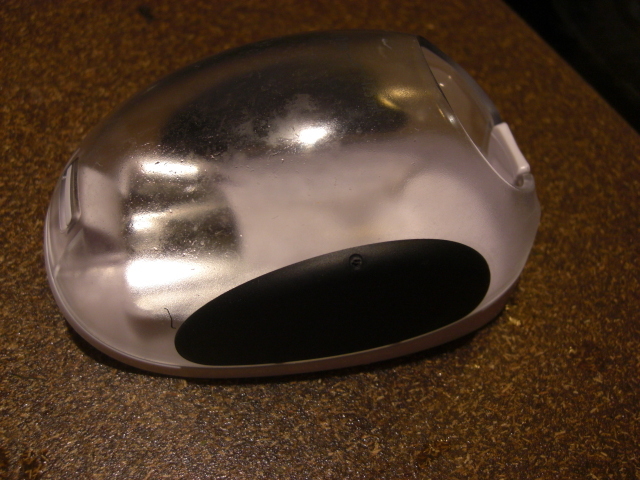 Then brace the top of the ear in the bottom of a bowl, like this. 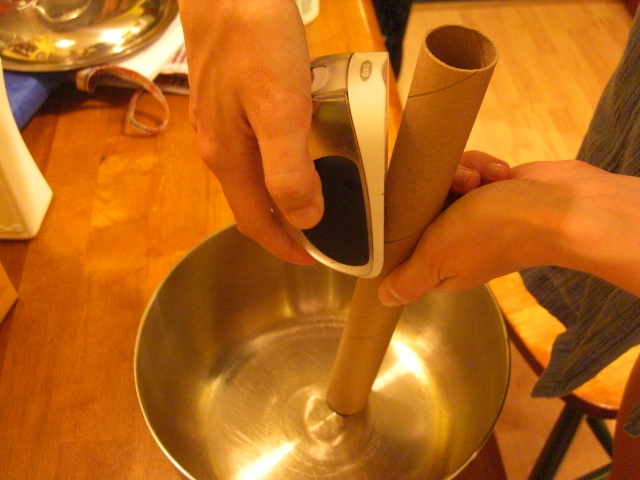 Works for paper towel rolls, too! Then you can push downward with more force, more safely. You have a lot more control pushing down than pushing up, and your non-cutting hand stays out of the danger zone. Hope this helps – stir-fried sweet corn is too good to miss! 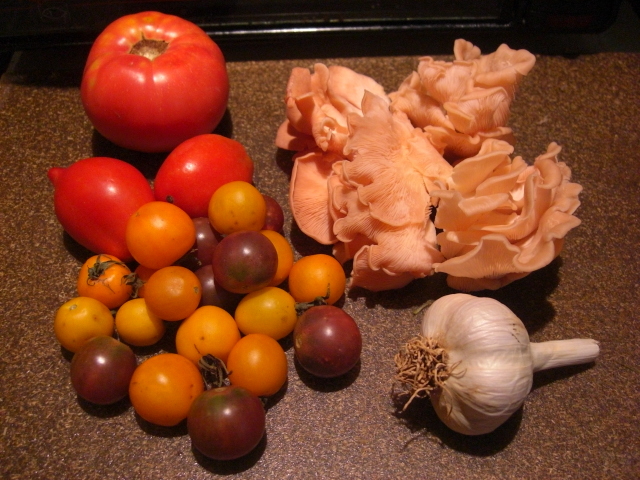 Here’s what I got last Wednesday from Farmers’ Fresh. I also bought several things from the online store. 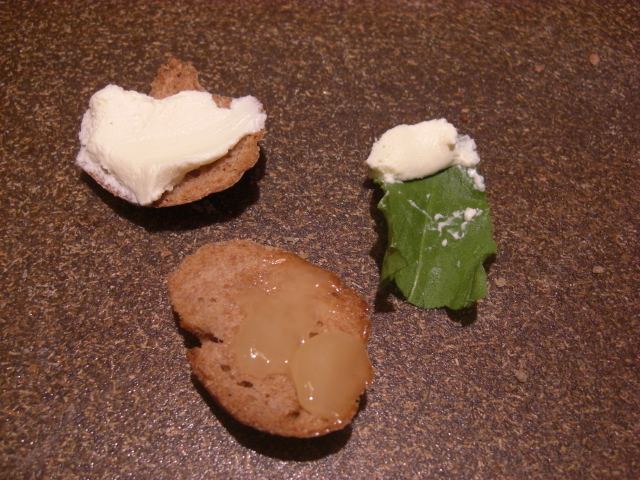 I tried out the crème fraiche with a piece of bread and a sorrel leaf. The top two snacks didn’t work so well. 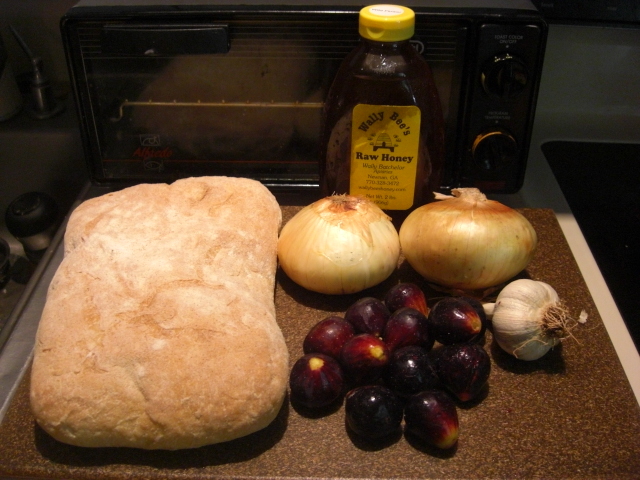 (But the bottom snack of bread and creamed honey was delightful.) The crème fraiche is too tart to go with the sorrel, but immediately made me think of the mushrooms tucked away in the fridge. 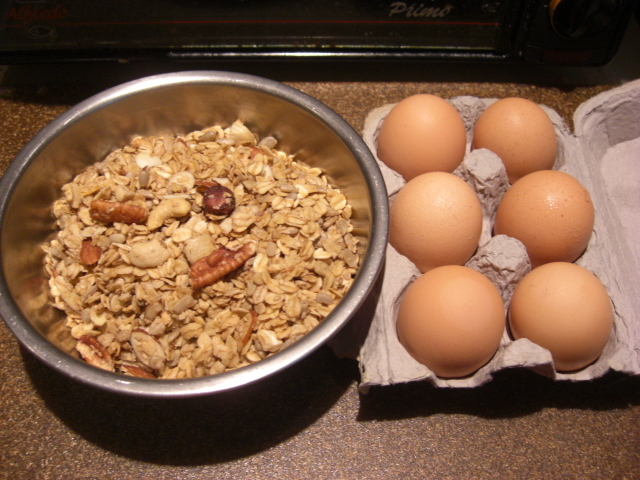 So, even if the snacks didn’t work as such, they inspired supper…. 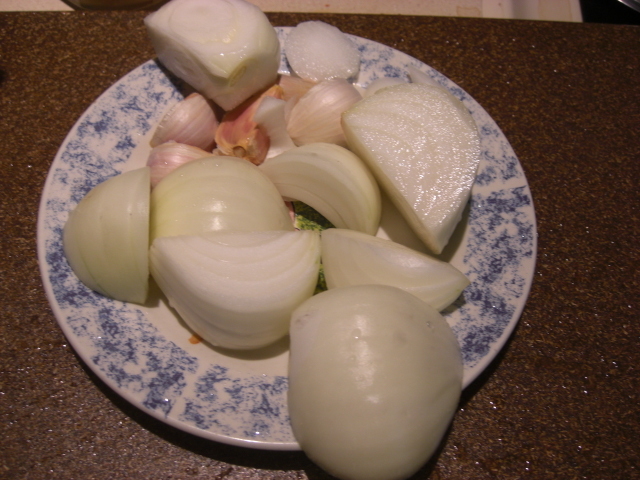 First I minced a quarter of one of the sweet onions and a clove of garlic. 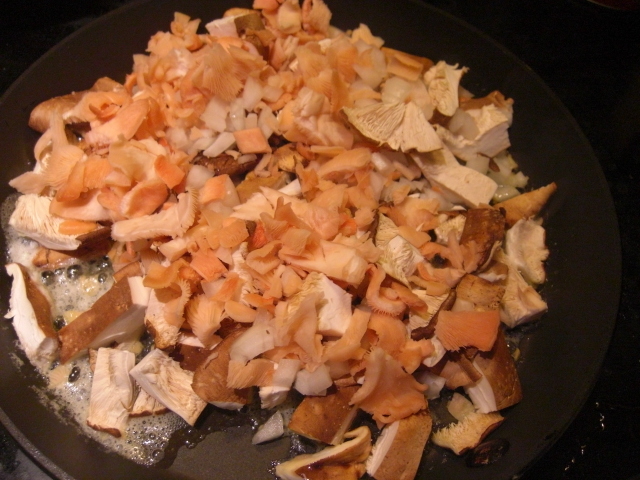 Then I chopped the oyster and Shiitake mushrooms and reserved the stems for later stock or stir-fries. Then I melted some butter and threw everything in to saute along with some salt and pepper. After about 15 minutes, I added some white wine and herbes de provence, let it cook for a minute, and then turned the heat to low. 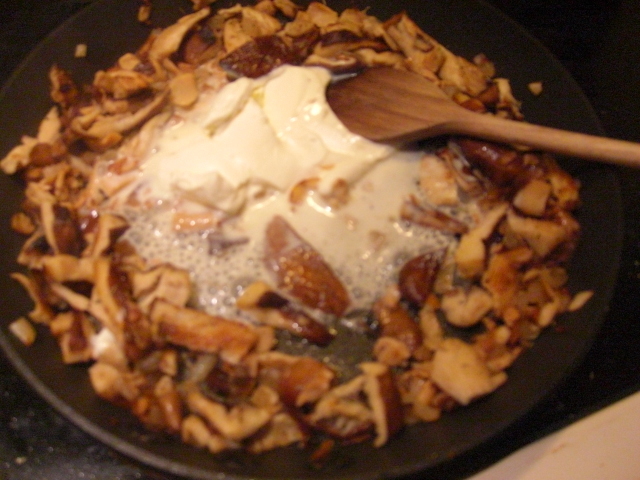 When the heat was down, I added half a cup of the crème fraiche. Sorry about the blur. The aroma was so tempting that the camera got excited and wouldn't sit still. The results were incredible. It was almost too rich. Almost. 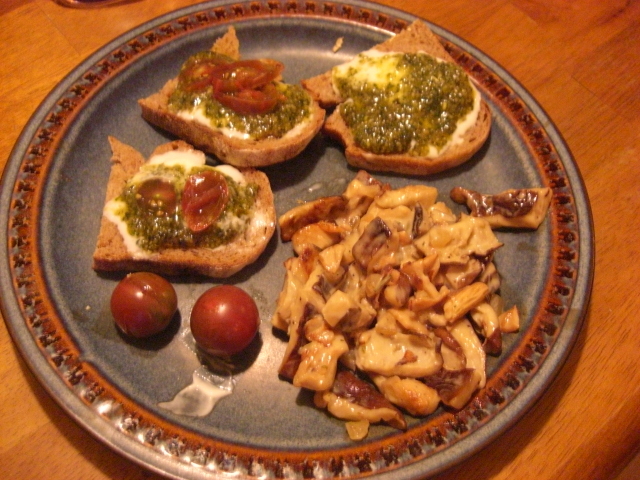 Also on the plate was pesto-crème fraiche toast and grape tomatoes. (I started off slicing the tomatoes to go on top of the toast, but they were explosively juicy, and it seemed better to serve them whole.) 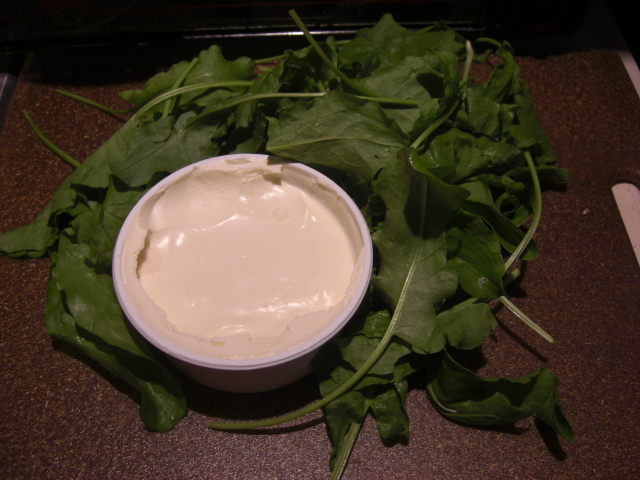 The pesto-crème fraiche combination was interesting and tasty – just not in the same league as the mushrooms. 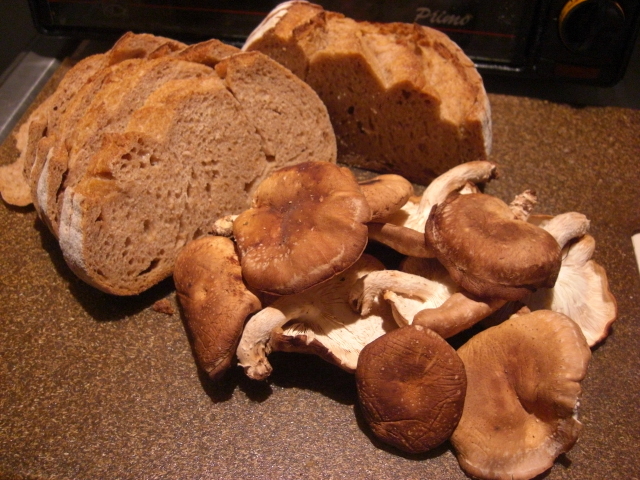 Next time, I’ll serve the mushrooms over rice with a little salad. And there will definitely be a next time.